Clinical diabetes and coronary artery disease (CAD) are preceded by MS.3 MS is at least 5 times more common than diabetes in most populations except Asian Indians. The prevalence of MS among South Asians is higher than in other Asians and Europeans, but lower than in Americans using conventional criteria. 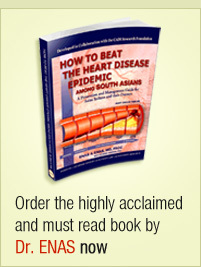 See Metabolic Syndrome and heart disease, Metabolic Syndrome and diabetes. Several studies have shown that lower cutoff values for WC among Indians optimize the cardiovascular disease (CVD) risk than in Europids.4 Asian Indians have a high prevalence of diabetes and various components of MS, but the prevalence of MS is paradoxically low due to the failure to use the ethnic and gender specific criteria for abdominal obesity and/or the requirement of abdominal obesity as a mandatory component.3See Metabolic Syndrome criteria. Abdominal obesity is the major driver for the widely prevalent MS and diabetes in Asian Indians in India as well as the Diasporas. Asian Indians exhibit several unique features of obesity; excess body fat, abdominal adiposity, increased deep subcutaneous and intra-abdominal fat, and deposition of fat in ectopic sites (liver, muscle, pancreas etc.) compared to Europids. See Asian Indian phenotype, Metabolic Syndrome as the common soil. The prevalence of MS among Asian Indian women is higher than in US women, but lower in Asian Indian men than US men. See Metabolic Syndrome in women. Primary treatment of MS is lifestyle therapy and includes weight loss, increased physical activity, and an antiatherogenic diet. Adopting a healthy lifestyle beginning in childhood and adolescence is warranted in view of the malignant nature of CAD among Asian Indians. Simple cost-effective tools like the IDRS can be used to screen for MS in developing countries, where measurement of the lipid profile is costly and often not feasible. Because the adverse effects of these factors are greater in Indians, the benefits of modifying the factors are correspondingly greater and may prevent the onset of diabetes. 1. Tillin T, Forouhi N, Johnston DG, McKeigue PM, Chaturvedi N, Godsland IF. Metabolic syndrome and coronary heart disease in South Asians, African-Caribbeans and white Europeans: a UK population-based cross-sectional study. Diabetologia. Apr 2005;48(4):649-656. 3. Enas EA, Mohan V, Deepa M, Farooq S, Pazhoor S, Chennikkara H. The metabolic syndrome and dyslipidemia among Asian Indians: a population with high rates of diabetes and premature coronary artery disease. Journal of the cardiometabolic syndrome. Fall 2007;2(4):267-275. 4. Snehalatha C, Viswanathan V, Ramachandran A. Cutoff values for normal anthropometric variables in Asian Indian adults. Diabetes Care. 2003;26(5):1380-1384. 5. Alberti KG, Eckel RH, Grundy SM, et al. Harmonizing the metabolic syndrome: a joint interim statement of the International Diabetes Federation Task Force on Epidemiology and Prevention; National Heart, Lung, and Blood Institute; American Heart Association; World Heart Federation; International Atherosclerosis Society; and international association for the Study of Obesity. Circulation. Oct 20 2009;120(16):1640-1645. 6. Juhan-Vague I., Thompson SG, Jespersen J. Involvement of the hemostatic system in the insulin resistance syndrome. A study of 1500 patients with angina pectoris. The ECAT Angina Pectoris Study Group. Arterioscler Thromb. Dec 1993;13(12):1865-1873. 7. Anand SS, Yusuf S, Vuksan V, et al. Differences in risk factors, atherosclerosis, and cardiovascular disease between ethnic groups in Canada: the Study of Health Assessment and Risk in Ethnic groups (SHARE). Lancet. 2000;356(9226):279-284. 8. Palaniappan L, Anthony MN, Mahesh C, et al. Cardiovascular risk factors in ethnic minority women aged less-than-or- equal30 years. Am J Cardiol. 2002;89(5):524-529. 9. Ajjan R, Carter AM, Somani R, Kain K, Grant PJ. Ethnic differences in cardiovascular risk factors in healthy Caucasian and South Asian individuals with the metabolic syndrome. J Thromb Haemost. Apr 2007;5(4):754-760.